First-century Corinth is a city teeming with commerce and charm. It’s also filled with danger and corruption―the perfect setting for Ariadne’s greatest adventure. Desperate to keep him safe, Ariadne risks her good name, her freedom, and the love of the man she adores to become her father’s apprentice. As her unusual athletic ability leads her into dangerous exploits, Ariadne discovers that she secretly revels in playing with fire. But when the wrong person discovers their secret, Ariadne and her father find their future―and very lives―hanging in the balance. I cannot begin to say how wonderful I thought this book was! I loved everything! 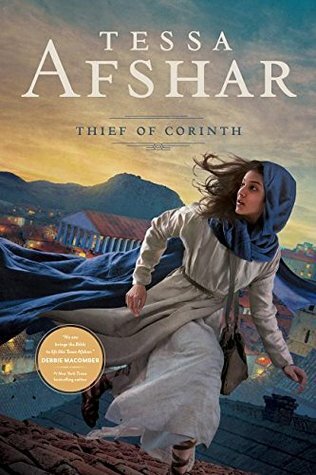 Tessa Afshar is a wonderful writer and historian, fleshing out details of ancient life and bringing it to life! Ancient medical practices and foods and clothing and even bathroom/toiletry habits are all woven into the story – as well as a little suspense and romance and Christian teaching. I loved how she gave the apostle Paul his own words but in the story context with a loving tone. From experience I know that when I pick up a book by Tessa, I will enjoy it – this exceeded the expectation and I loved it! I highly recommend it and look forward to the next one! I received a copy of this book from the publisher. I am freely writing a review – all thoughts and opinions are my own.